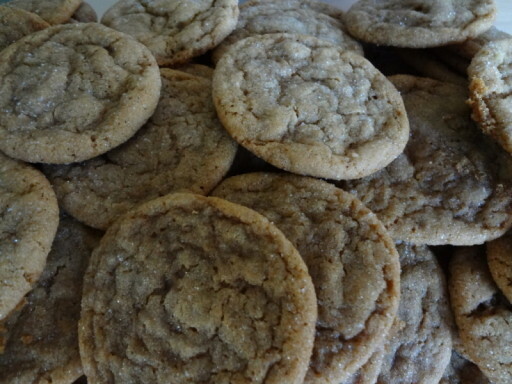 Do they count as gingersnaps if they are soft and chewy? Whatever you want to call them, they are addictingly delicious. I originally got the recipe from allrecipes a couple years ago. The recipe makes 5 1/2 dozen cookies. I made a batch in mid-December and by Christmas I was making another batch because we had eaten them all (we being just the two of us). They are now a holiday staple in our house. In a mixing bowl, cream butter and sugar. Add eggs, one at a time, beating well after each addition. Beat in molasses. Combine the flour, baking soda, cinnamon, ginger, cloves, salt and nutmeg; gradually add to creamed mixture. Refrigerate for 1 hour or until dough is easy to handle. Roll into 1-in. balls; roll in sugar. Place 2 in. apart on ungreased baking sheets. Bake at 350 degrees F for 8-12 minutes or until puffy and lightly browned. Cool for 1 minute before removing to wire racks.